AUTOCLIMA is located in Piedmont (North West Italy) in the neighbor of Torino. We are a medium size Industry of 98 people, working since 1963 with the sole mission of develop, manufacture and sell Air Conditioning systems for Transportation. 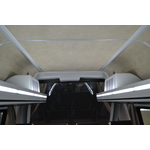 Easy Air is the first system which includes evaporator and air ducts for buses/midibuses with the main purpose to allow the manufacturer/body-builders to reduce weight, costs and installation time, when compared with current solutions on the market.